Real Madrid and AC Milan collided in New York this Wednesday night and the Merengues decided to put on a show as they humiliated the Italian side in a 5-1 win. Cristiano Ronaldo scored his first two goals of the pre-season and helped the Spanish champions to continue 100% victorious on this United States pre-season tour. 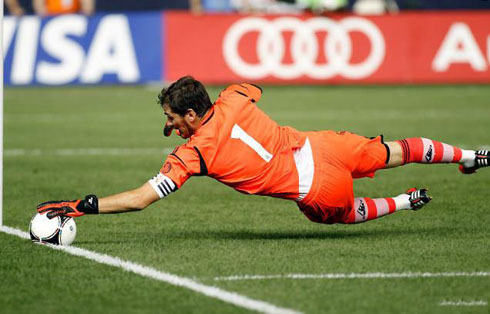 Real Madrid ran over AC Milan at the Yankees Stadium this Wednesday night, beating the Rossoneri by an impressive 5-1 score. Cristiano Ronaldo led the charge with two goals, followed by Angel di María, Sergio Ramos and Callejón. The Italian vice-champions lonely goal was obtained by Robinho, but the Merengues proved to always be a superior side, as well as clearly better prepared to face the new challenging season. 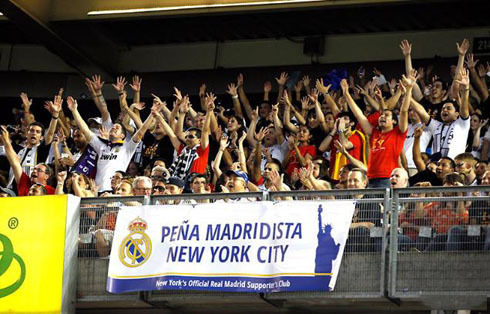 With only one friendly game left on Real Madrid's schedule, the Merengues will now try to close this United States tour with a golden key and for that to happen, they will have to defeat the Scottish champions, Celtic Glasgow, this Saturday night. José Mourinho's side confirmed the high expectations everyone had for them for this match and crushed AC Milan's pride with a victory that left no room for contestation. The first goal still took a while to appear, but it was definitely worth the wait... Mesut Ozil took a corner kick on the left that Abiatti punched a few meters away from Milan's penalty area. Quickly to react, Angel di María fired a spectacular first touch shot without letting the ball touch the grass, giving Real Madrid a one goal lead. However, the Rossoneri had a small reaction reserved for the following minutes and reached the equalizer close to the 33th minute. Antonio Cassano found Nocerino with some space on the left and lobbed the ball towards him. The Italian midfielder then spotted Robinho free from any kind of marking and assisted him for a top-notch finish. The former Real Madrid forward showed that he still has plenty of quality and that he's most likely going to be AC Milan's main hope for the upcoming season, now that Ibrahimovic has left to join PSG. No more goals were scored until half-time, as the draw remained for a few more minutes. The second half basically started with Cristiano Ronaldo showing why he remains being regarded by many as the best player in the World. CR7 scored from a terrific left-foot shot, literally unstoppable no matter what goalkeeper was in front of him. Right foot or left foot, Ronaldo is warming up the engines and we can be confident about witnessing another great season from the Portuguese superstar! With the Merengues on the lead, the game started being controlled by José Mourinho's men in a more proeminent way and the 3-1 arrived near the 65th minute. Once again, Cristiano Ronaldo finished a good Real Madrid counter-attack play, but this time, he was assisted brilliantly by Ricardo Kaká. The Brazilian midfielder keeps appearing on most newspapers' headlines due to the theoretical likelihood of him leaving the club, even though José Mourinho seems to still hold high hopes for the former FIFA Balon d'Or winner, as the new season starts to unfold. With 81 minutes on the clock, Real Madrid extended the lead with a powerful header from Sergio Ramos. Everything was becoming easier and Kaká's corner kick on the right found the Spanish defender on the peak of his jump, allowing him to score his first goal of the pre-season. The Italian vice-champions were authentically put against the ropes and there was still a final blow waiting to be applied, as Real Madrid wasn't giving signs of wanting to slow down. Just before the final whistle, the Merengues reached their 5th goal of the match and once again, from a good assist made by Kaká. It all started from a superb pass from Xabi Alonso, who found Ricardo Kaká with enough space to receive the ball and take on a defender. The Brazilian then lobbed the ball to the far post, granting Callejón with a precious chance to also put his name on the scoresheet. The "canterano" didn't miss the opportunity and sealed the victory, setting the final score at 5-1. Cristiano Ronaldo seems to be returning to his old form, but before starting the new season Real Madrid still has one more test left, against the Celtic Glasgow, this Saturday night (11-08-2012). You can watch Juventus live stream, Real Madrid vs Celtic, Valencia vs Tottenham, Hannover 96 vs Manchester United and Brazil vs Mexico from our football live streams section.